This 15 May, Vesak 2558/2014 was being celebrated in Indonesia. Vesak, or Waisak in Bahasa Indonesia, is a Buddhist holiday commemorates the birth, enlightenment and death of Buddha or Tri Suci Waisak. The holiday is celebrated in full moon in May (Purnama Sidhi). It is celebrated in South East Asia and also all over the world. In Indonesia, Waisak is being celebrated nation-wide by all Buddhists in Indonesia, with the biggest celebration being held in Borobudur Temple. The ceremony was being held in Borobudur Temple since Tuesday evening (13/5) until daybreak in Thursday (15/5). It started in Mendut Temple. A series of ceremony with holy water and perrenial fire was held. The water as a symbol of purity was taken from Umbul Jumprit (Jumprit Lake) in Temanggung Regency, meanwhile the fire symbolizing enlightenment was taken from Grobogan, Purwodadi in Tuesday morning. 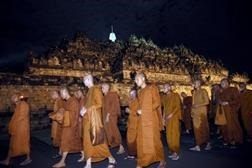 In Wednesday morning, more than 100 Bhikku Theravada and Mahayana were doing 3 kilometers walking procession or Pindapata, in Jalan Raya (Main Road) Pemuda, Magelang. Pindapatta, comes from panda (food) and patta (patra, bowl), is a ritual symbolizing unpretentious ness and gratefulness where Bikku and Bikkhuni receives food tributes from the community. In the evening, ceremony attended by Indonesian’s Religion Minister and Governor of Central Java was being held. The ceremony was also involving walking in the night from Mendut Temple to Borobudur Temple, going across Pawon Temple, Elo River, and Progo River. In the walk, paritta, or chanting Buddhist verses were also being done. Early morning in the next day, all the attendants were saying the prayers in the main altar of Borobudur. In the west altar, giant Buddha statue on a lotus throne were fully attended by food, candles, flowers, and incenses for tributes. Ghata Visaka Puja prayers were chanted after candles symbolizing dhamma or respect for Buddha and wisdom was being lit. The prayers then closed by walking around the temple three times clockwise (Pradaksina) and releasing 1000 paper lanterns together. The ceremony in Borobudur is not only involving Buddhists in Indone sia. There are also devotees from other countries who come, such as from Taiwan, Thailand, Vietnam, Japan, India, Sri Lanka, Malaysia, USA, Australia, China, and others. Roughly 30000 people are celebrating Waisak in Indonesia each year. Other than in Borobudur, Waisak is also being celebrated in other Vihara in Indonesia, such as in Vihara Satyamuni, Aceh, Vihara Ekayana, Jakarta and other provinces. The ceremony in Borobudur is also open for public. 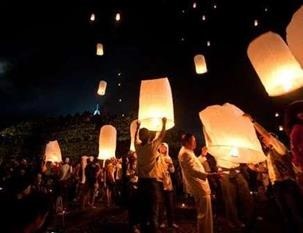 People usually come to see the ceremony and to join the lantern release. You can also join the ceremony for next year’s celebration! It has to be noted that first and foremost, it is a religious ceremony, so if you want to join, you have to take respect to the celebration and the devotees before your own enjoyment. How about the celebration in your country? Posted on June 24, 2014, in Culturing and tagged aseankorea, buddhism, celebration, religion, vesak, waisak. Bookmark the permalink. Leave a comment.